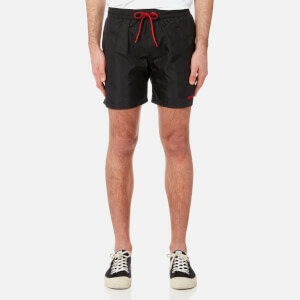 Men’s navy swim shorts from Italian fashion label, Diesel. Crafted from quick-drying fabric, the 'BMBX Wave' swim shorts are detailed with a vibrant, dual-colour drawstring to adjust the fit of the waist. The back of the shorts feature a back pocket with a signature design, a contrast coloured eyelet and a brand patch. Complete with a logo print on the left leg.